Skin conditions such as dryness, rashes, warts, and acne commonly affect the pediatric population. At times, skin conditions can be multifactorial and don’t always respond to the same treatment for everyone. Below, I will highlight some of the most common skin disorders in babies, young children, and teens. Eczema, often referred to as atopic dermatitis, is a very common skin condition in both babies and young children, and can even carry into adulthood. Although symptoms can vary from person to person, eczema is typically characterized by dry, itchy skin, often worse at night. It may appear as red or brownish-gray patches, often presenting on the hands, feet, ankles, wrists, neck, eyelids, and insides of elbows, and back of the knees, and in infants, commonly presents on the face and scalp. Skin may appear rough, raw, sensitive or swollen from scratching. Complications to watch for with eczema include skin infections, other allergies, or sleep disorders due to the chronic scratch-itch cycle that can lead to poor sleep quality. Prevention with eczema is often the key and includes adequate moisturizing of the skin. Affected areas to infants should be moisturized at least twice daily, and it is recommended to use a cream or emollient based moisturizer as it will help to seal in moisture. First line products that are recommended are often Aveeno, Eucerin, or Aquaphor. Parents can also try to identify and avoid triggers that may worsen the condition such as certain bath soaps, detergents, and other environmental allergies. If prevention and over-the-counter remedies don’t seem to control symptoms, evaluation by a medical provider is often necessary for prescription treatment options. These include medications that help control the itching and help to repair the skin, and may include topical corticosteroids to be used sparingly. Other treatments may include medications to treat infection if that is felt to be present in severe cases. At times, even oral steroids may need to be considered to control symptoms. 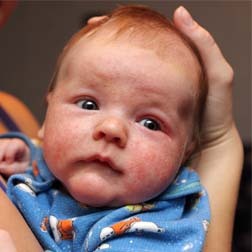 It is best to see your provider if you are concerned about your infant or young child having eczema. Typically, a diagnosis is made clinically, and testing is not required. Molluscum contagiosum is a viral condition that typically presents as small, raised, round skin bumps. It often appears in small clusters, and can vary in size from a pinhead to pencil eraser. The classic appearance of molluscum is that the small bumps often have a small indentation or dot at the top/center. It can be present anywhere on the body, but most commonly presents on the face, neck, armpits, hands, arms, and lower extremities. It is often asymptomatic, but can cause inflammation, redness, and may be itchy. Although this condition does not pose any threat to the child, many parents choose to treat the condition due to its ease of transmission. Scratching or rubbing the bumps will spread the virus to the surrounding skin, making the condition worse. Direct skin-to-skin contact will also spread the virus, as well as contacts with objects contaminated by the virus, including toys, towels, and other household items. To avoid spreading the virus, children should keep the areas of skin affected by molluscum covered by clothing/bandage when around other individuals. They should avoid sharing towels, washcloths, or other personal items. Children should avoid touching the bumps and wash their hands often. When swimming, the bumps should be covered by a waterproof bandage. Although molluscum typically goes away without treatment, once the immune clears the virus within 6-12 months, many providers will choose to treat the virus because it is so contagious. Topical treatments may be applied to the skin to cause irritation and help the immune system clear the virus, or antiviral creams can be applied but may take longer to work. In-office procedures to remove the bumps such as scraping or freezing them can also be performed, and rarely, laser therapy is considered in individuals felt to have a compromised immune system who may not otherwise clear the virus on their own. All of these mentioned treatments need to be performed under the supervision of a medical provider. Common warts are another common skin condition in young children. They typically present as small, raised skin growths that often occur on fingers or hands. They are rough to the touch, and often feature a pattern of tiny black dots, which can be referred to as the ‘seeds’, which are actually small clotted blood vessels. Warts are caused by the human papillomavirus (HPV) and are considered contagious. They are transmitted by skin to skin contact, either spread between people or to other areas of the body by infected individuals. This virus can also be spread by touching something that another person infected with the virus has touched, such as a towel, toys, or sports equipment. The appearance of warts will also typically resolve on their own, but many people choose to treat or remove them because they find them bothersome or embarrassing. Treatment should also be considered if growths are painful, change in appearance or color, or if the skin lesions interfere with activities. You should seek medical attention if you are concerned your child has a wart, or to discuss appropriate treatment options. Acne is a skin condition that occurs when hair follicles or pores become plugged with oil and dead skin cells. It can results in whiteheads (closed plugged pores), blackheads (open plugged pores), or pimples, and often presents on the face, chest, upper back and shoulders. It is one of the most common skin conditions affecting teens/adolescents; however, it can affect people of all ages. Acne can result in painful papules and even large, solid or cystic appearing lumps beneath the surface of the skin resulting in redness, inflammation, and even infection. The most common causes of acne include excess oil production, clogged hair follicles/pores, bacteria, and excess activity of hormones, particularly androgens. Certain medications can worsen appearance of acne, and diet and stress are also felt to contribute to acne symptoms. Although hygiene, eating greasy foods, or use of certain cosmetics are easy to blame for the appearance of acne, they really have been shown to have little effect. Typically once over-the-counter medications have been used for a number of weeks without improvement in appearance/control of acne, individuals will visit with their medical provider to consider a prescription treatment. Goals of medical treatment often include control of acne symptoms and appearance, as well as avoidance of scarring or other damage to the skin. With most prescription drugs, results may not be noted for four to eight weeks, and appearance of acne may actually appear worse before it gets better. It can ultimately take many months to years for acne to clear up completely. It is recommended to see your medical provider to discuss treatment options best suited for each individual. Some providers will also recommend non-prescription treatments such as laser therapy, chemical peels, extraction of whiteheads/blackheads, or even steroid injections, and in addition to consideration of prescription therapies, it is also important to discuss lifestyle and home remedies that should always be considered in a treatment regimen.